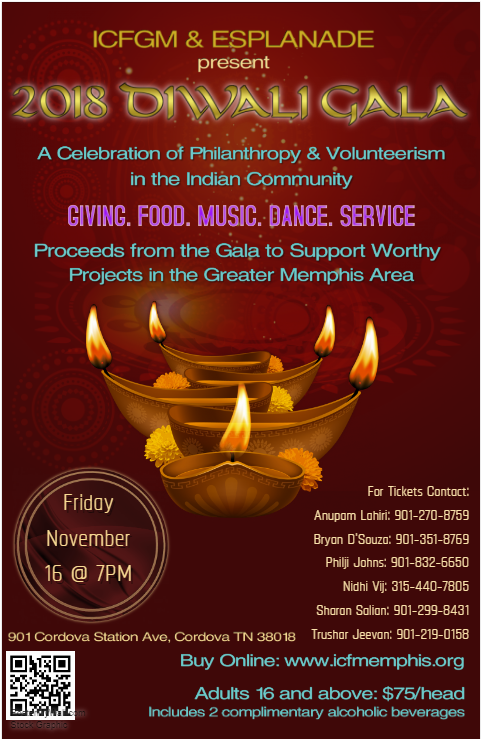 Last year we had a successful Diwali Gala and raised over $15K. All proceeds from the ticket sales and our annual allocation were given to worthy organizations and causes around Memphis including, Church Health, Memphis Police Department, DeNeuville Learning Center, Bridges Memphis, Urban Bicycle Food Ministry, Germantown Performing and Arts Center, and Wolf River Conservancy. Let’s meet again for an evening of music and dance, great food and camaraderie while we support our local community. Tell us what local organizations inspire and you wish to support. You’ll have a chance at the event to interactively choose the money should go. Together, we will make a better Memphis for all of us! Spread the light…share event details and round up your friends for a festive night! ICFGM gratefully acknowledges receipt of your generous gift of $75.00. 100% of the proceeds will be used exclusively for charitable purposes by ICFGM; Each contributor will receive an all-inclusive Diwali party on October 13th, 2017 at Esplanade with a fair market value of $25 for goods and services. Accordingly, in compliance with IRS Code Section 179(f)(8), this receipt serves as verification that only $50.00 of your contribution qualifies for a charitable deduction under the Code. 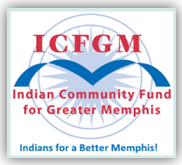 ICFGM is a donor advised fund #1660, at Community Foundation of Greater Memphis, a 501 C(3) charity, Federal Tax ID 58-1723645. Click on “Add to Cart” to add each item to your shopping cart. Quantities can be edited on the shopping cart page.